The Experts in Data-Driven and AI-First Finance with Python. 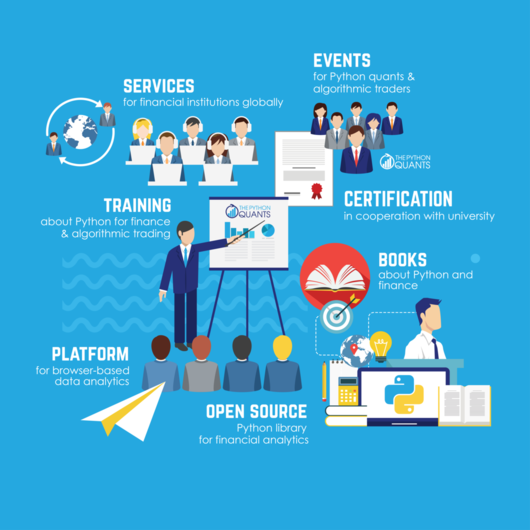 We focus on Python and Open Source Technologies for Financial Data Science, Artificial Intelligence, Algorithmic Trading and Computational Finance. We are active in the following areas. 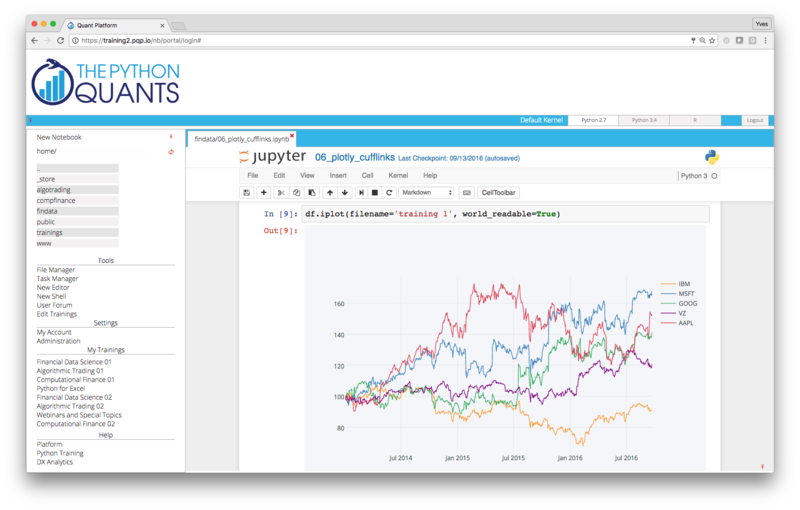 Quant Platform brings you browser-based, interactive, collaborative data & financial analytics using Python, R, Julia and more. 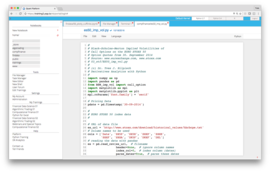 DX Analytics brings powerful derivatives and risk analytics to Python. 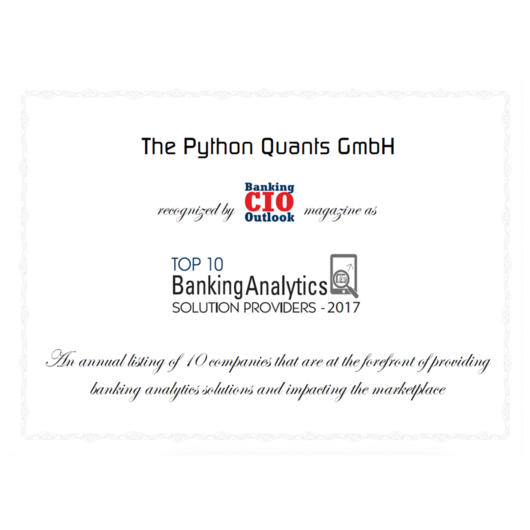 Benefit from decades of experience in Python and Quant Finance to build modern analytics solutions efficiently and fast. Read our books Python for Finance, Derivatives Analytics with Python and Listed Volatility & Variance Derivatives. We offer consulting, development and training services in all financial capitals (eg Frankfurt, London, New York, Singapore). 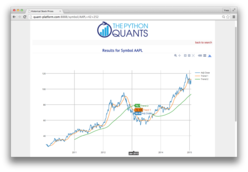 We conduct Python for Quant Finance meetups and For Python Quants bootcamps. We love the community. 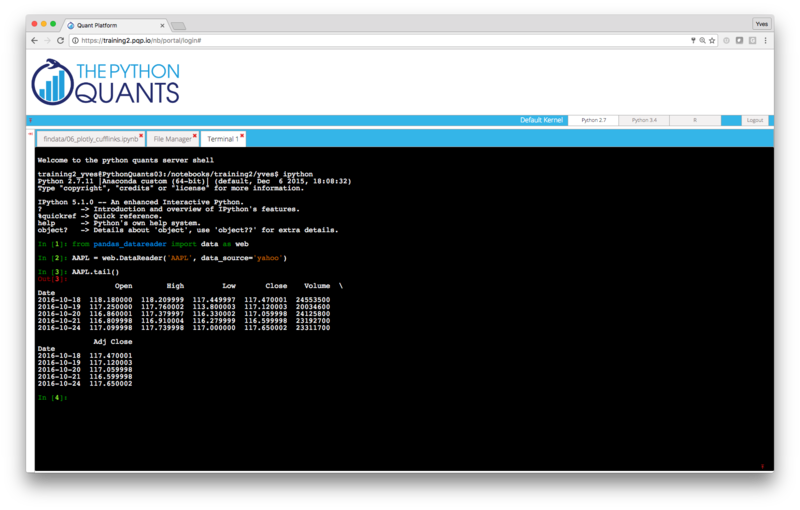 The Experts in AI-first Finance with Python. We focus on Python and Open Source Technologies for Financial Data Science, Artificial Intelligence, Algorithmic Trading and Computational Finance. All you need to beneficially apply Python for finance and algorithmic trading. 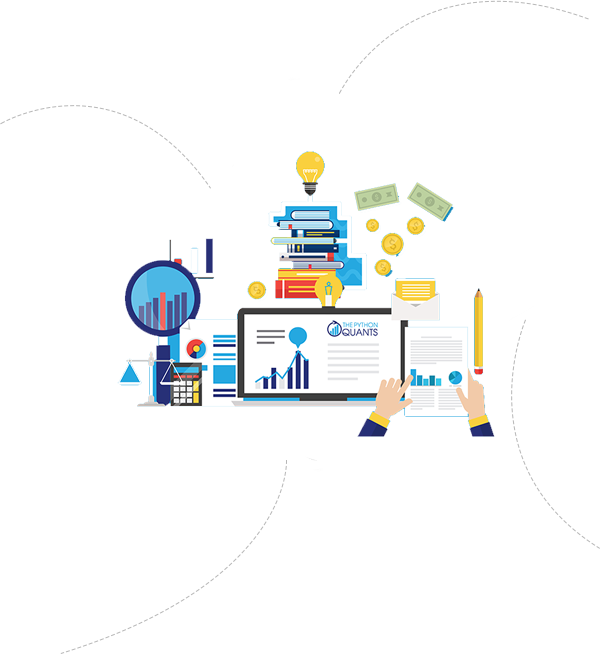 Experience a new level of productivity and a new approach to collaboration in financial analytics. 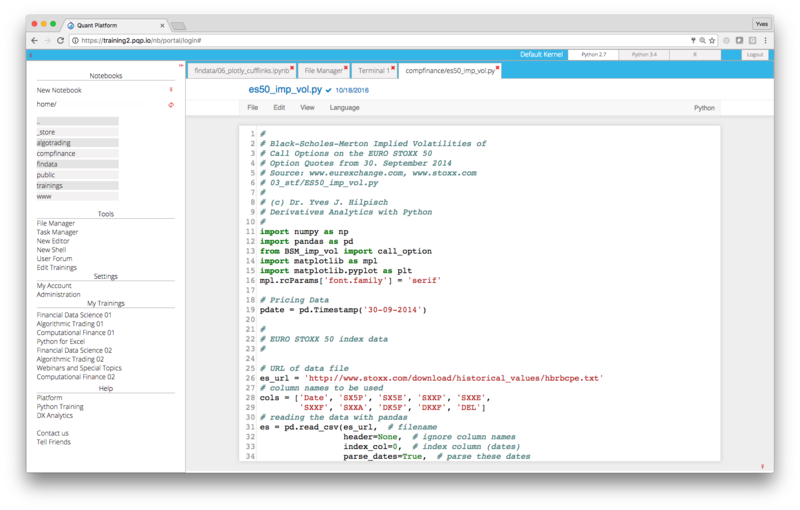 The platform offers eg Jupyter Notebooks, full browser-based shell acess, GUI-based filemanagement, project/file sharing & publishing. Get a free trial. 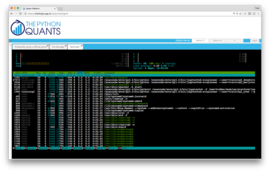 Completely modular and object-oriented open source library to model, manage, price and risk manage complex portfolios of (multi-risk) derivatives with potentially complex correlations structures. Optimize portfolios, value interest swaps and more. 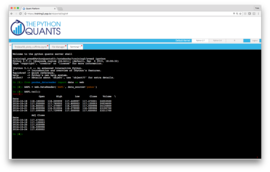 Visit http://dx-analytics.com. 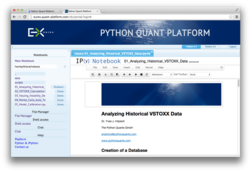 Yves Hilpisch, Managing Partner of The Python Quants, has written three books on the use of Python in Quant Finance. 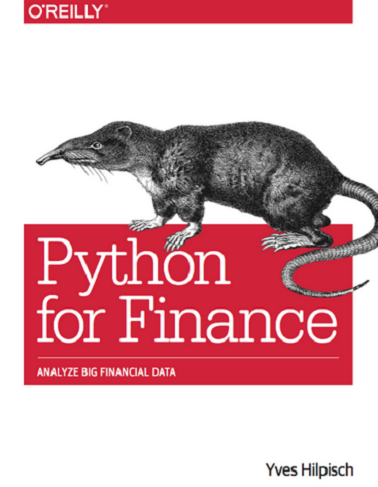 The first is Python for Finance (O'Reilly, 2014). 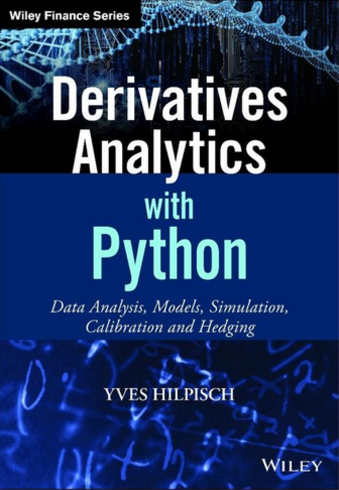 The second is Derivatives Analytics with Python (Wiley Finance, 2015). 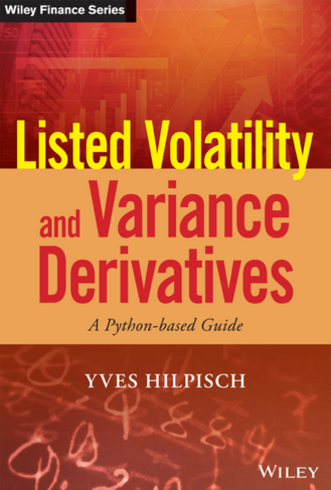 The third is Listed Volatility & Variance Derivatives (Wiley Finance, forthcoming). 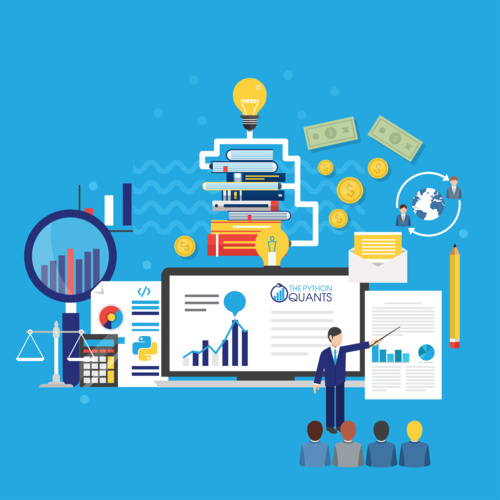 We help you in any way to start using Python for Quant Finance, to solve specific problems or to conduct ambitious, path-breaking projects. Be it with consulting, development or training. 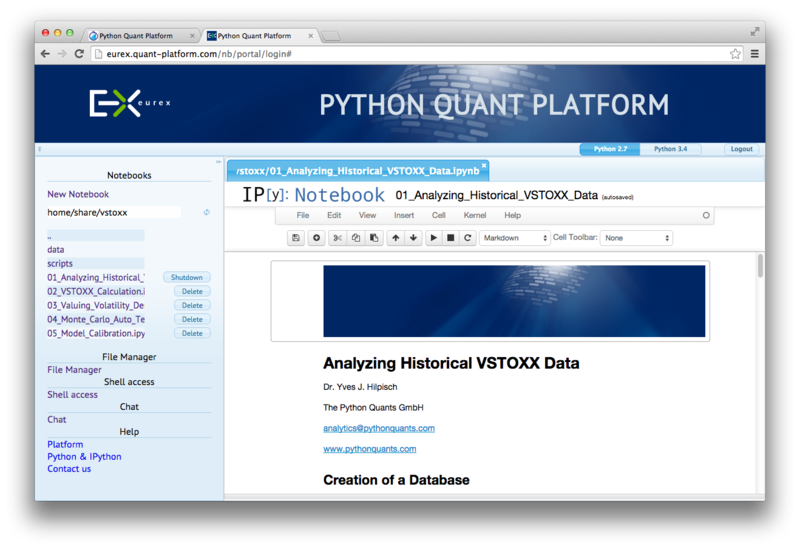 We help you transition from eg Matlab & streamline your analytics with Python. philosophy: "Absorb what is useful, discard what is not, and add what is uniquely your own." Our unique set of training offerings. Tailored to your needs. This class covers the basics of Python and its scientific stack as needed in finance. See the training page and check out our new intro course. 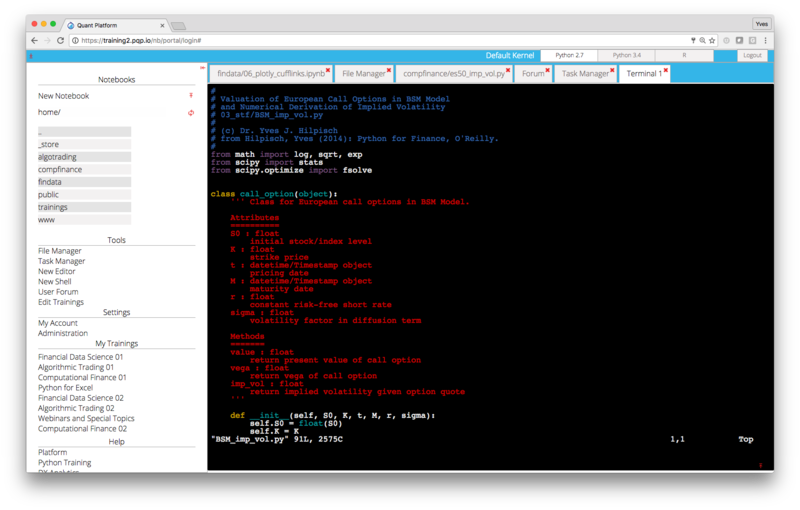 This class is about automated, algorithmic trading with Python. After this class, you can set up your own trading operation. 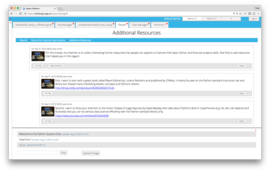 See the training page and check out our new course. Option pricing and "Rocket Science" on Wall Street have long been dominated by compiled languages like C++. 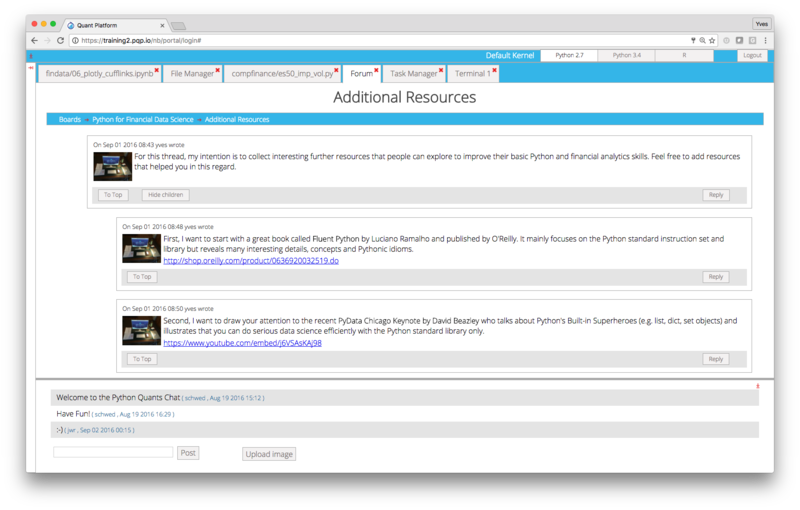 Nowadays, Python is an attractive alternative. 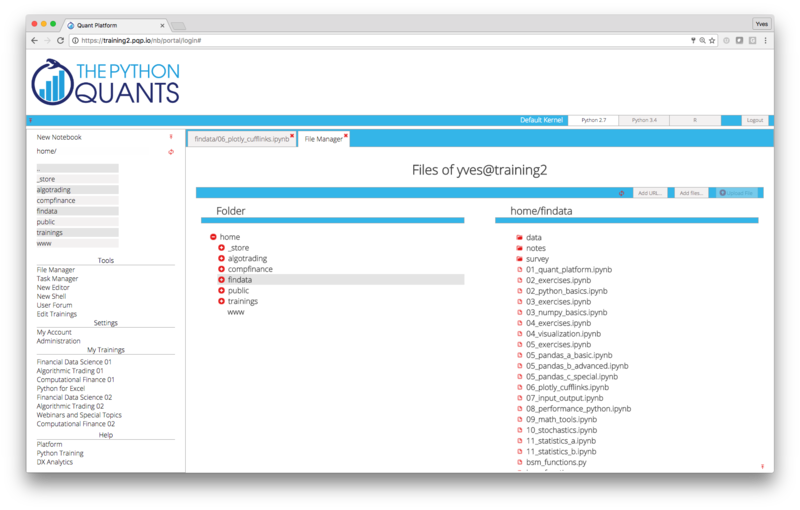 See the training page. 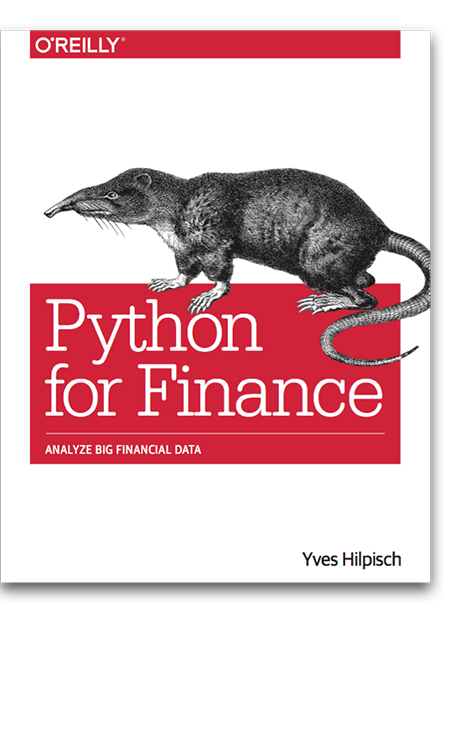 Python for Excel and Python Best Practices cover two really important topics in Python for Finance. See the training page. 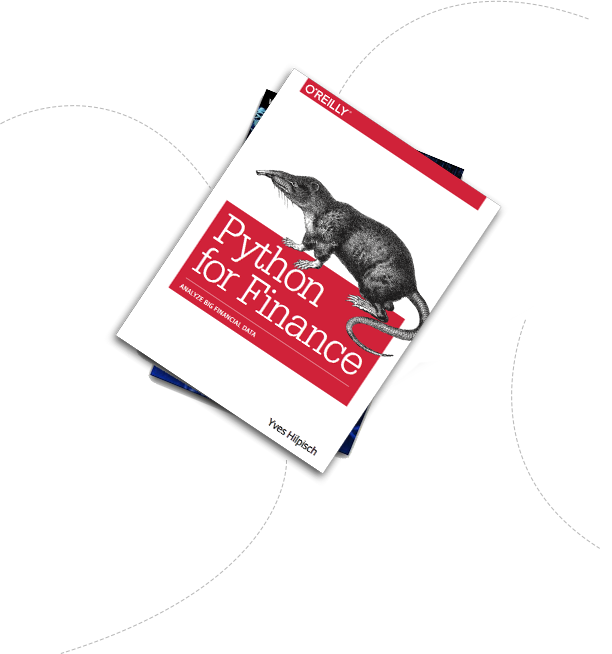 Read our books to learn about the power of Python for Finance. 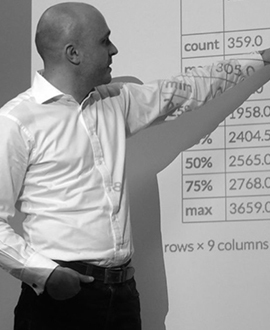 Profit from our expertise: our team members are experts in Python, Quant Finance, Python for Excel, modern analytics infrastructures and more.